Summer is the optimum time for a barbecue; the sun is shining, the birds are singing, the grass is green and warm underfoot. That’s all well and good, but what happens if you want to entertain while living in a place that is dominated by winter for at least half of the year? That’s where artificial turf comes in. 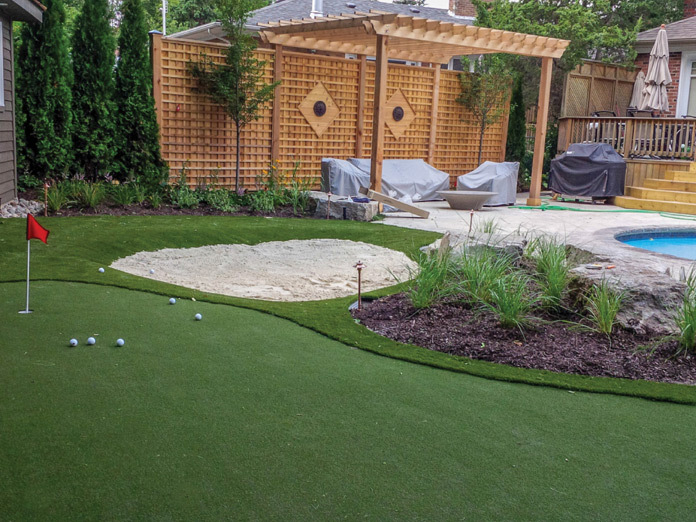 Artificial turf is extremely advantageous for people who enjoy greenery in colder climates. It is also commonly used for putting greens, and is an appealing alternative for areas where it is difficult to grow grass. Its precise installation is one of the specialty services that we at M&S Architectural excel in. One of the reasons behind that is a devotion to quality, and with the experience we have acquired over the years in installing artificial turf at many styles and sizes of property, you can be sure that we are capable of providing the perfect product to complement the aesthetic of your outdoor space. We insist on using only expert craftsmen who know their trade, tools and will only accept the highest quality end result; we won’t leave your property until this is achieved! Artificial turf if an investment that continues paying you back for as long as you continue to live in your house. Purists will argue that natural turf is superior to artificial turf. However, for someone who wants to use their patio and outdoor kitchen 365 days a year, this is simply untrue. Artificial turf is extremely easy to maintain. You never need to cut or water it, and it stays green all year. On top of that, should something unfortunate occur, it is extremely easy to clean and will prevent mud and grass from being tracked into your home as well as being weather resistant. Other advantages stem from the fact that this is not the first iteration of “Astroturf”. The industry has had decades to change and evolve to suit the needs of an ever-growing customer base. Modern artificial turf looks and feels like natural turf, right down to the individual blades of grass. Due to its chemical composition, it warms faster than natural turf, and can assist with removal of snow, and so is ideal for people with little time, or, should it apply, physical inability to move a lot of snow. The advantages of artificial turf are clear. M&S Architectural Ltd. is happy to offer its expert installation as part of the multifaceted service package available to anyone and everyone in the Aurora, Caledon, Newmarket and King City areas.